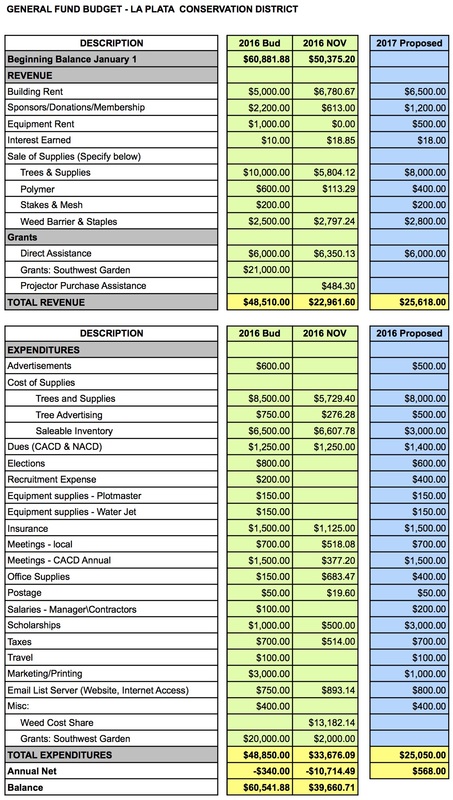 This budget was reviewed and approved at the Board Meeting on Tuesday, November 15, 2015. The La Plata Conservation District receives $0 from mill levies. PURPOSE: To describe the important features of the district budget. This budget provides fiscal guidance for the district during 2017 and reflects its priorities. Most of our revenue is income derived through tree sales, sales of supplies, rental of equipment and rental of an office in Pagosa Springs. Income from the rental of this office is shared between the three districts that own the facility: the La Plata, San Juan, and Pine River Districts. Educational Services in the form of workshops. The budgetary basis for accounting this district uses is: Cash basis.